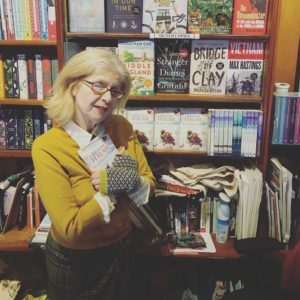 Last night’s book launch at West End Lane Books in Northwest London was such a wonderful, joyous occasion that I feel truly blessed this morning. Thank you, Danny and Heidi, for your hard work and all of you who came along. 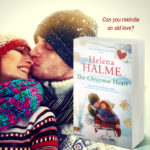 The first reading from The Christmas Heart seemed to go down well and we had some interesting discussions about literary genres, writing in another language, translation and on sharing your own life stories. 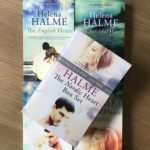 I talked about the sticky situations the first novel in The Nordic Heart Series, The English Heart, has landed me in. 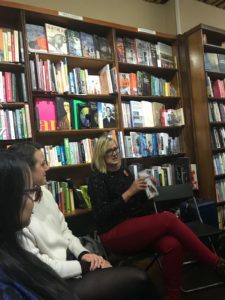 I’ll probably talk about those again at the next event and on the blog tour – see below. 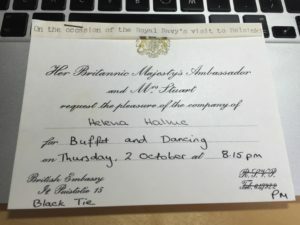 Of all of my titles, The English Heart follows my own life most closely; how I met and fell in love with my Englishman at the British Embassy cocktail party in Helsinki. Last month, the Englishman and I celebrated 38 years since that first, fateful meeting. I cannot really believe that soon it’ll be forty years since we first set eyes on each other. Where has all that time gone? When I was gathering together documentation for the UK Home Office for my residency application (you guessed it, due to Brexit), I came across this, the original invitation I received from the British Embassy all those years ago. (If you’d read The English Heart you’ll know how pivotal this cocktail party at the Embassy in Helsinki was). It even has the Englishman’s address scrawled with my lipstick on the back because we couldn’t find a pen anywhere. This is another little detail I added to The English Heart because it was just too good to leave out. Following last night’s successful launch, you can imagine how delighted I was when I woke up this morning to find that The English Heart is Number 2 on Amazon’s best seller list! 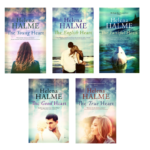 So I thought that as well as sharing images from last night’s book launch, I’d let you know that the ebook copy of The English Heart is now free on Amazon until 11 November. 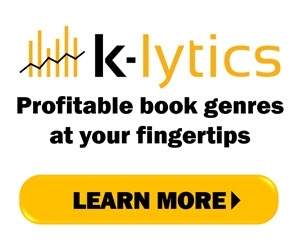 This is a limited offer, so if you’d like to download the book, do it now before Sunday! Just tap here get your free copy. 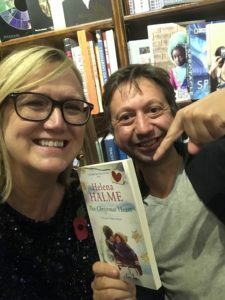 If you couldn’t make last night’s event, there is a Blog Tour for The Christmas Heart starting on Monday 12th November (details below) and another book launch at the Finnish Church in London on 2nd December. Details for this event are found here and the Facebook event page is here. 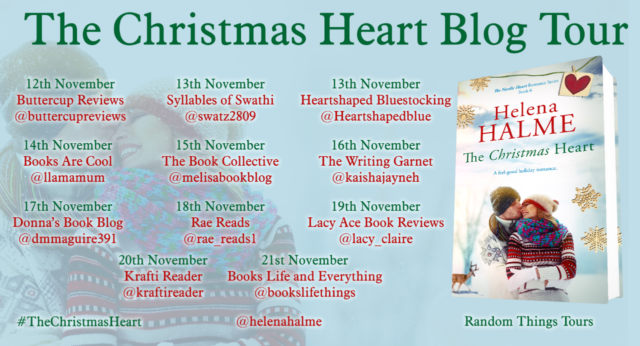 Do come along if you are in London early December and drop in on the blogs that will feature The Christmas Heart in November. 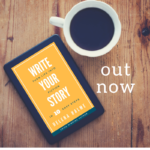 Write Your Story – A New Book!